So your knee went through the wall in your hallway, or some similar situation, and now you have a large drywall hole that needs to be repaired. You can either call a professional and spend an arm and a leg, or you can make the repair yourself. 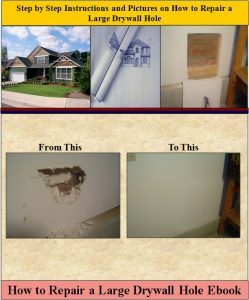 The “How to Repair a Large Drywall Hole Ebook” will show you how to repair your wall to as good as new. The “How to Repair a Large Drywall Hole Ebook” from HomeAdditionPlus.com thoroughly explains how to remove a section of drywall that includes the hole, replace it with a new drywall patch, tape and mud it, and finally paint it. The instructions are simple to follow and easy to understand! Pictures are included in every step of the process! Order Now and Immediately Download the How to Repair a Large Drywall Hole Ebook today! The How to Repair a Large Drywall Hole EBook costs only $11 and is 100% guaranteed.